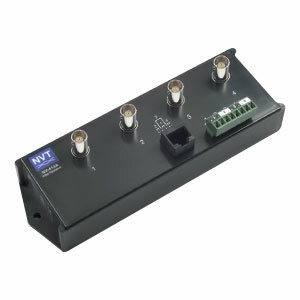 NV-413A 4-channel Video Transceivers is a passive (non-amplified) device that allows the transmission of real-time monochrome or color video over Unshielded Twisted-Pair (UTP) telephone wire. Baseband (composite) signals of any type are supported. “Up-the-coax” type signal may be sent over the same wire pair. Used as a receiver, the NV-413A is fully compatible with qualified cameras that are equipped with an NVT twisted-pair output. The unparalleled interference rejection and low emissions of the Model NV-413A allow video signals to co-exist in the same wire bundle as telephone, datacom, or low-voltage power circuits. This allows the use of a shared or existing cable plant. With built-in transient protection, damaging voltage spike problems are eliminated.